alaTest has collected and analyzed 12212 reviews of Samsung Galaxy Tab 2 7.0 (P3100). The average rating for this product is 4.3/5, compared to an average rating of 4.5/5 for other products in the same category for all reviews. Reviewers are impressed by the portability and size. The price and performance also get good opinions. Opinions are divided on the apps. Samsung's Galaxy Tab 2 (7.0) is a smart choice for budget-conscious buyers looking for a dependable Android 4.0 tablet on the cheap. 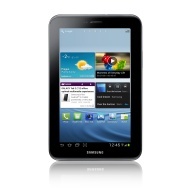 The Samsung Galaxy Tab 2 7.0 4G LTE (Verizon) includes dual cameras, memory expansion, and fast 4G LTE speeds with no contract. $350 is a lot of money for a 7-inch tablet with the Tab 2 7.0's feature lineup. The screen resolution is lower than the Nexus 7's and the back camera lacks an autofocus feature. The Samsung Galaxy Tab 2 7.0 4G LTE (Verizon) delivers on 4G speeds and features, but is too expensive to recommend.